Turn to our ABO-certified optician for your vision services. 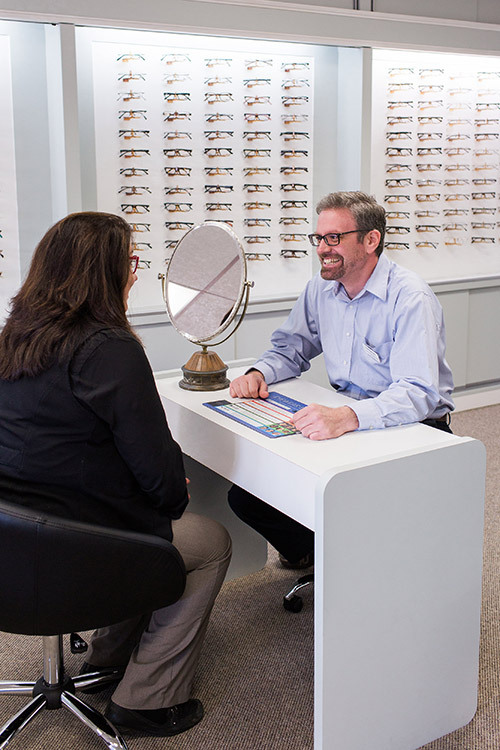 Whether you need to update an existing prescription, your existing eyeglasses repaired, or want to change your look, feel at ease knowing we’ll go above and beyond to meet your needs. We can even troubleshoot existing eyewear issues and recommend solutions to help! We offer the latest lens technology from several manufacturers …there is no “one lens fits all”! What is a Licensed Optician? A Licensed Optician is specifically trained to design, verify and fit eyeglass lenses , frames, contact lenses and other optical devices and tools to assist or correct eyesight. They utilize prescriptions from Optometrists, ophthalmologists and Osteopaths. In Maine, a licensed Optician maintains a national certification, which enforces a standard of practice and training, ongoing continuing education and membership in the national board of Opticianry. No, Berries does not participate with any vision plans. However, most vision plans offer an out of network reimbursement. We are more than happy to help you fill out those forms so you can receive your reimbursement directly from your vision plan. This is a tough question to answer. It depends on the prescription, type of lens, and any options that are added to the lens. Our average turnaround time is between 2.5-5.5 business days. In emergencies, we can generate glasses within 24 hours, depending on the above criteria. What is the average cost of glasses? This is another difficult question, because of variety of frame and lens styles and options that are available. We have frames that start at $99. Do your lenses and frames have a warranty? Absolutely! All of our frames have at least a one year warranty against any manufacturer defects, with many of our vendors offering a two year warranty. All of our lenses with a non glare treatment have a 2 year warranty for scratches. All of our untreated lenses have at least a six month warranty, unless otherwise noted. Even our polarized sunglasses have a limited scratch warranty! Do you repair broken glasses? Yes, if it is repairable, we will give it our best shot. There are some repairs, depending on where the damage occurs, that are not fixable. Please stop in with your broken glasses, and we will provide an honest assessment and a free estimate! In the state of Maine, only a licensed optometrist or ophthalmologist can write a prescription for glasses and/or contacts. We currently do not have either one of these on staff. However, we have a referral connection in the Brunswick area where we can refer our patients. Yes, and we usually are less than most major online contact supply websites. Give us a call and we can provide a quote. How long are prescriptions good for in Maine? Prescriptions for glasses are good for 2 years and 1 year for contact lenses. Of course, provided the frame can handle lens the lens insertion process. Improve your vision with prescription glasses or contact lenses that fit your lifestyle and budget.